Growing up, the only mussels I ate were served southern-Italian style, sauced with a hot marinara and accompanied by a thick bread biscotto to sop up the condiment. Today, it’s a dish I make quite often at home. In the summer of my junior year in high school, however, I spent 14 weeks in France with a group of classmates, studying the language and serendipitously broadening my culinary horizons. During that time, we were forbidden to speak English or to consume anything that wasn’t French. In fact, near the beginning of our stay, on a day trip through the Loire valley, our teacher and guide, a true Francophile Jesuit, went apoplectic at lunch when the restaurant, seeing us as tourists, brought out bottles of ketchup with our steak frites. “Enlever le ketchup!” (Remove the ketchup!) he demanded. The ketchup disappeared—alas. We were studying at the University of Grenoble and took most of our meals in the school’s cafeteria. But when we were on our own, a few friends and I would venture into local bistros. 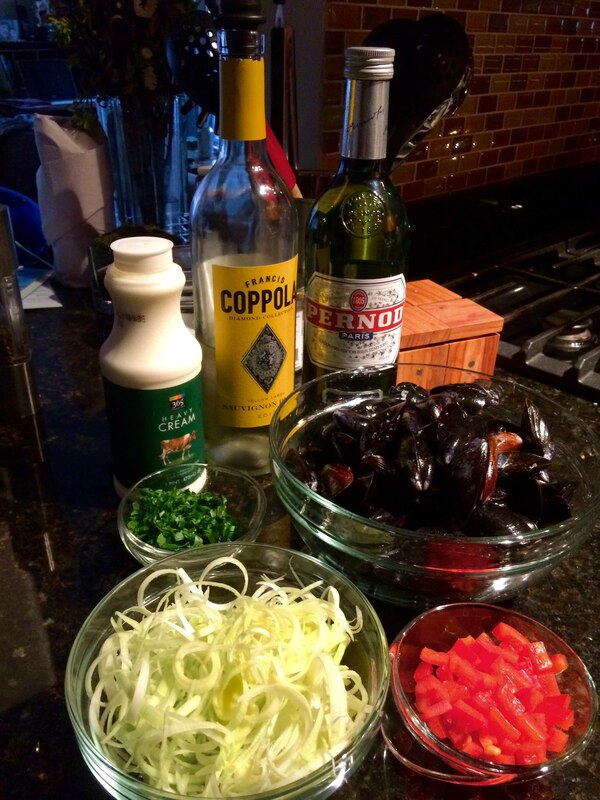 It was on one of these days that I discovered a dish that would become one of my French favorites: moules au Pernod, mussels napped in a light sauce of cream, onions, and Pernod. 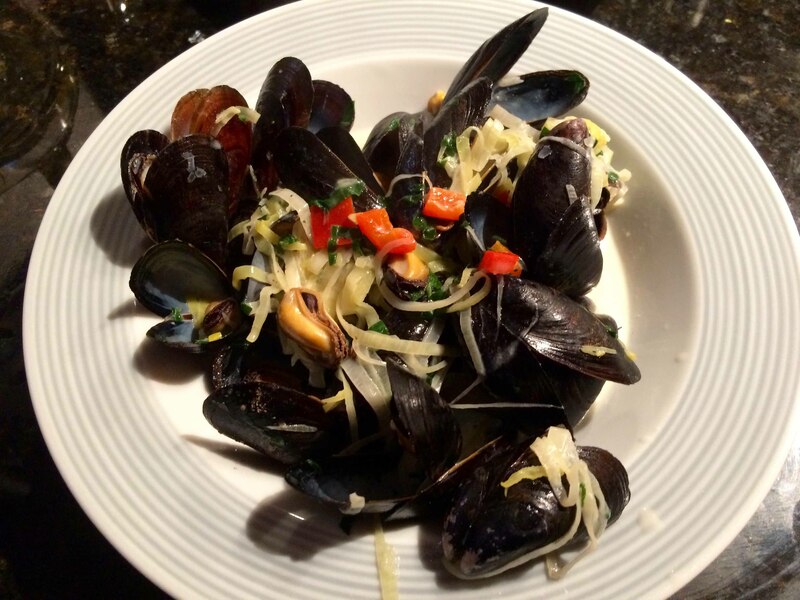 The smooth anise-scented sauce provided the perfect counterpart to briny mussels. It’s the perfect summer’s night entree, especially paired with a crisp Sauvignon Blanc, preferably a Sancerre, and a crusty baguette to get the last bit of sauce. 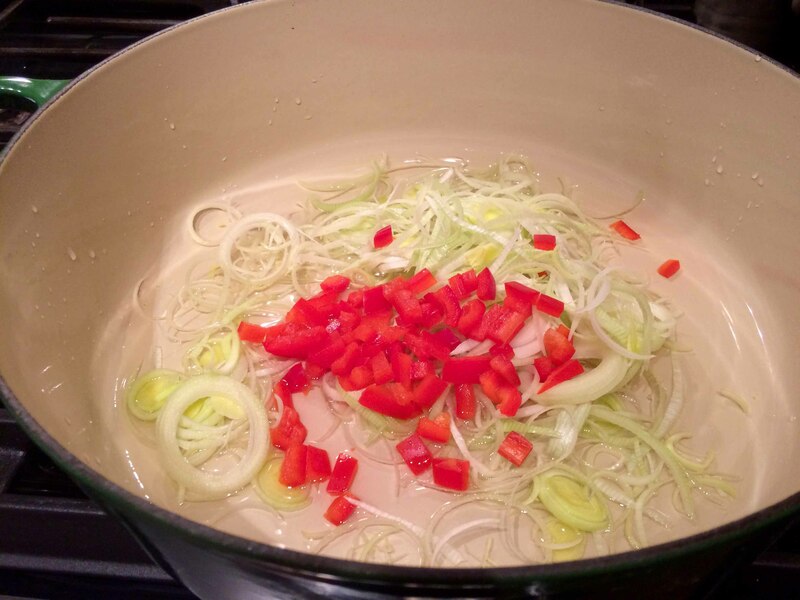 Combine the sliced leeks, wine, and bell pepper in large heavy-bottomed non-reactive pot. Bring to boil over high heat. Add the mussels. Cover the pot and cook until mussels open, about 5 minutes, shaking the past once or twice. 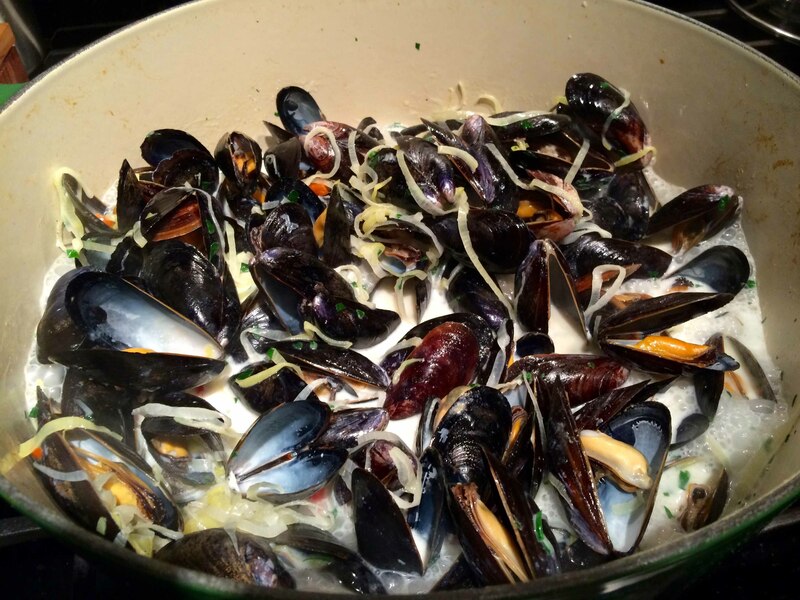 With a slotted spoon, transfer the mussels to a bowl (discard any mussels that do not open). 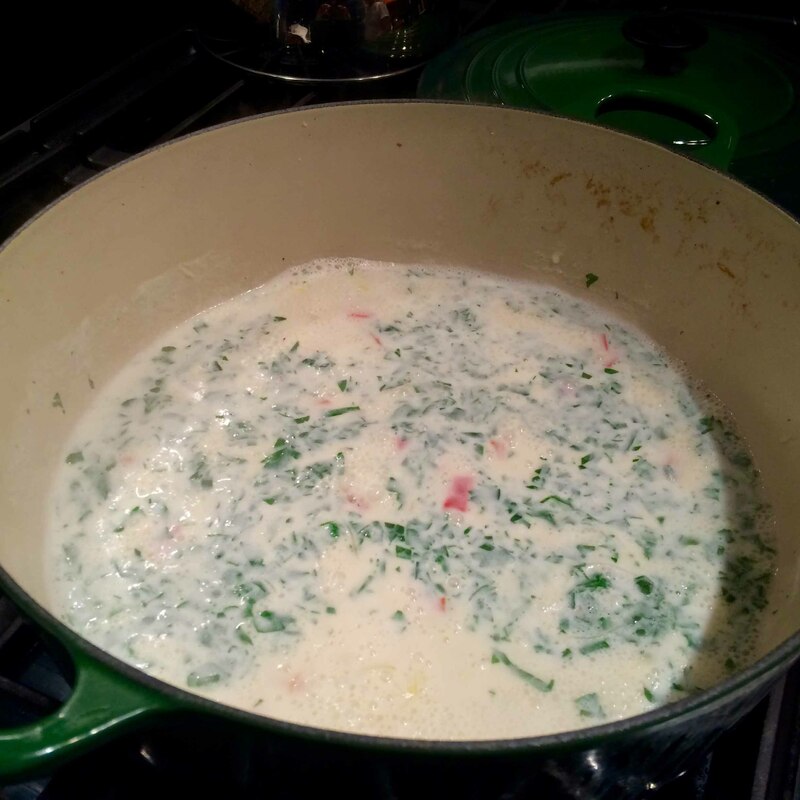 To the pot, add the cream, salt and pepper to taste, and Pernod. Boil until liquid is slightly reduced, about 4 minutes. Mix in chopped parsley. Return the mussels and any accumulated juices to pot. Simmer until mussels are warmed through, about 1 minute; adjust the seasoning. 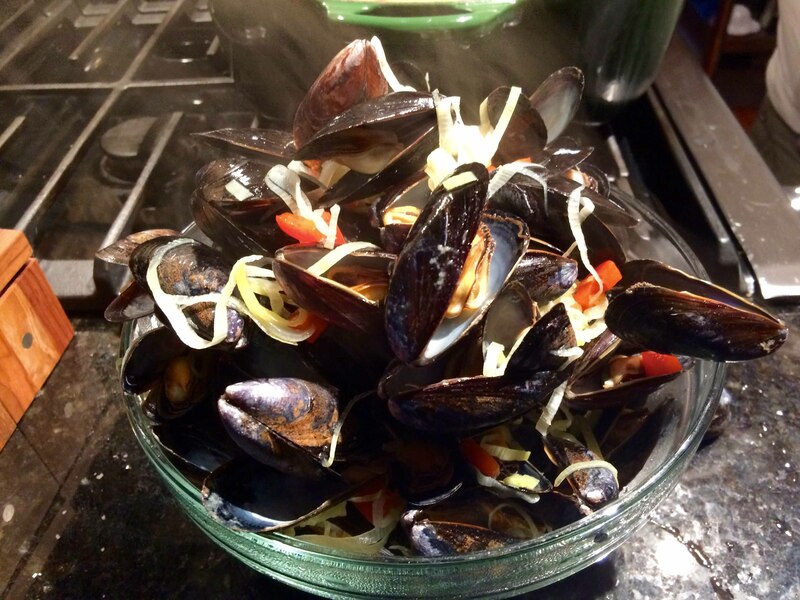 Serve mussels with the sauce. Great to be back, John. When I was your age, it was an appetizer…alas at mine it’s a meal.